Cantera Stone - Limestone Direct - Architectural Stone Elements is a world class operation founded by Jose Villa with extensive international experience in dealing with fine stone elements. We have an extensive network of talented artisans and craftsmen who work with us to design and craft our exquisite stone carvings. 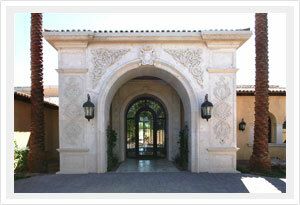 Our team has extensive full-cycle experience and passion with Cantera volcanic stone. We know how to work diligently and effectively with homeowners, builders, architects and engineers in procuring their needs and exceeding their expectations. We even have on-staff computer draftsmen to help integrate your plans into most architectural software programs. We will not stop until you are completely satisfied! Our team has visited extensively all the quarries we use so as to insure that we only use the finest qualities of stone elements. Aside from this, with larger and custom projects, we can work with you every step of the way. This includes from the selection of stone elements, to the design and hand-carving of the sculptures, to the logistics involved delivery and installation. Based in Arizona, Architectural Stone Elements welcomes either on-site client walk-ins or prospective distant clients through telephone and email proposals. We will even visit you! You will know you are in great hands with our unsurpassed friendly and professional service. From the sale of a unique sculpture to a massive project, we are here to help you. We ship nationwide and Canada!